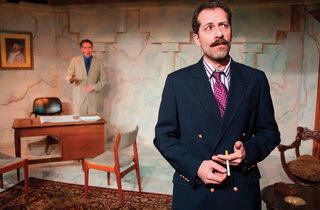 Howard Korder’s 2010 play uses a fictitious Middle Eastern country as a backdrop for philosophizing about art. 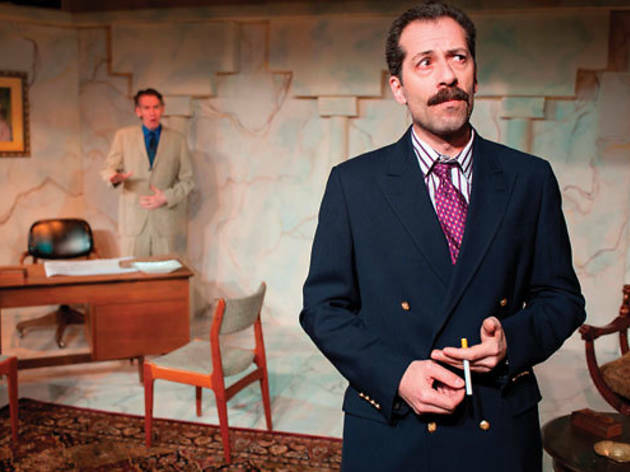 Set in the fictional Middle Eastern country of Aquaat, Howard Korder’s 2010 work concerns the nation’s Minister of Culture, Othman (Rom Barkhordar), and his protracted negotiations with an American architect, Hackett (Larry Grimm). Othman, a self-described architecture buff, wants to contract Hackett to design a new facility but will only describe his needs obliquely; Hackett, a once-rising star in his field whose time as an up-and-comer has come and gone, is desperate enough to have a project built that he allows himself to be strung along over the course of several years (the play’s nine scenes span 1989 to 2004). Korder’s hackneyed cultural comparisons (Hackett gets twice divorced, while Othman racks up additional wives) and the minister’s obfuscations and misdirections can leave us as frustrated as Hackett through the piece’s first act. Othman’s obsessive references to American films of the day (Dead Poets Society and Dances with Wolves, among others) seem at first little more than a gimmicky joke. Yet the play gradually reveals itself to be saying something about the nature and purpose of art. Though Othman spent time living in the U.S., it’s through Hollywood that he understands American culture. Similarly, the structure he asks Hackett to design—a “summer house,” or gazebo—strikes the architect as oddly unuseful and disappointingly small-scale, but Othman insists on its importance and demands that Hackett transcend his initial, half-assed attempts. All the while, a portrait of the country’s Saddam-like dictator looms over them, suggesting another function of art. Grimm and Barkhordar’s nuanced performances keep us interested, while Josh Horvath’s sound design makes masterful use of broadcast news snippets to evoke the time line.